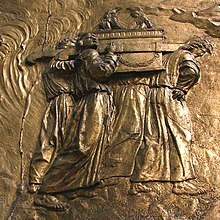 The Ark of the Covenant (ארון הברית in Hebrew: aron hab'rit) is described in the Bible as a holy container where the Ten Commandments and other holy Israelite objects are held. According to the Bible, Yahweh commanded the ark be built when Moses had a prophetic vision at Sinai (Exodus 25:9-10). Some people believe the Ark contained Aaron's Rod, a jar of Manna, and the first Torah Scroll written by Moses, based on their reading of Book of Exodus, Book of Numbers, and the Letter to the Hebrews. The first of the Books of Kings says that during the time of King Solomon, the Ark held only the Ten Commandments. The Hebrew word aron is used in the Bible to designate any type of ark or chest, for any purpose (Genesis 50:26; 2 Kings 12:9, 10). The Ark of the Covenant is distinguished from all others by such titles as "Ark of God" (1 Samuel 3:3), "Ark of the Covenant" (Josh. 3:6; Hebrews 9:4), "Ark of the Testimony" (Ex. 25:22). 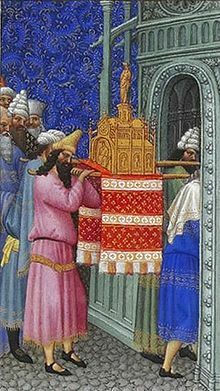 The Ark (aron kodesh in Hebrew meaning holy cupboard) is a raised cupboard found in Jewish Synagogues which contains the holy Torah scrolls. These are all written by hand and can take years to make. It is always on the wall of the Synagogue which faces towards Jerusalem. When the Ark is opened and the Torah removed for reading everyone stands in respect of God. During some prayers and services the Ark doors an inner curtain (parochet) are kept open. The Bible describes the Ark as made of acacia or shittah-tree wood. It was a cubit and a half broad and high, and two and a half cubits long (about 130 cm × 78 cm × 78 cm or 4.29 × 2.57 × 2.57 feet, for Egyptian royal cubit was most likely used). The Ark was covered all over with the purest gold. ↑ Further passages: God communicated with Moses "from between the two cherubim" on the Ark's cover (Ex. 25:22). The Ark and its sanctuary were "the beauty of Israel" (Lamentations 2:1). "Shemot - Chapter 25". Tanach - Torah, Judaica Press. "Ark of the Covenant". The Catholic Encyclopedia, Volume I.
Barrow, Martyn, "The Ark of the Covenant (Exodus 25:10-22)". 1995. Kaulins, Andis, "Ark of the Covenant". Shyovitz, David, "The Lost Ark of the Covenant". Jewish Virtual Library. JAH, "The Ark of The Covenant in Ireland". Israel National News "Kabbalist Blesses Jones: Now's the Time to Find Holy Lost Ark". Iyar 5765, May, 2005. Peters, Aland, "Templars excavaton of Solomon's Temple". Searcy, Jim, "The Ark of the Covenant: Present Location and Importance". Cyprus. Wyatt, Ron "The Ark of the Covenant: Ron Wyatt's description of his excavations for 3.5 years, and his claim to have seen it". Wyatt, Ron "The Ark of the Covenant: Found by Ron Wyatt north of Jerusalem in a cave,". "The Ark of the Covenant". Old Testament - Exodus, The Brick Testament. "". Book and Interactive CD-ROM detailing find of the Ark. Shapiro, Gerald N., "A small selection of the information collected on the subject". September 19, 2004. This page was last changed on 25 March 2019, at 21:55.